For decades Fernández had been recognized and honored for his accomplishments in the world of music. But up until October 11, 1991, no one had ever declared that as a singer, Fernández was on equal footing with perhaps the greatest singer in American pop history. In a career spanning five decades, Fernández has been awarded every honor and accolade in the entertainment world and beyond. He has won Grammys and Premio Lo Nuestro awards. He’s regularly topped the charts in Billboard and has been recognized with lifetime achievement awards, hall of fame honors and even a star on Hollywood’s Walk of Fame. With his trademark charro outfit, wide sombrero and impeccable backing mariachi ensemble, he has performed on the world’s biggest and most prestigious stages. He has headlined Mexico City’s Auditorio Nacional and the Plaza de Toros Mexico to New York City’s Madison Square Garden and Radio City Music Hall. Many considered Fernández to be Mexico’s fourth gallo, or singing rooster. The other three are considered the greatest all-time singers in Mexico. But they all died young – Jorge Negrete at 42 in 1953, Pedro Infante at 39 in 1957 and Javier Solis at 34 in 1966. It was into this profound artistic void that Fernández stepped in 1966. 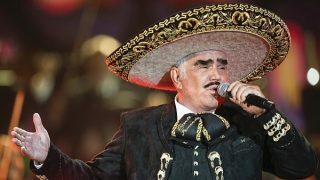 For more than 40 years, Vicente Fernández has maintained his standing as Mexico’s greatest living singer, coupling an operatic range with a deep understanding of ranchera music’s rural roots. Through the years he inspired hundreds of imitators, but none could ever match his operatic power and range. In the dozens of Mexican movies he starred in, Fernández often played a role that suited him perfectly-that of the proud charro, or Mexican cowboy. As a world-class singer, Fernández always combines impeccable musicianship, provocative songs and his great vocals to deliver unforgettable performances. He was and continues to be prolific, influential, and ultimately a critical player responsible for shaping the growth and development of the modern ranchera genre. For his artistic integrity, his tireless dedication, and unending enthusiasm, Fernández will be noted in history books as one of the fundamental and influential pioneers of ranchera music and a towering figure in the evolution of Regional Mexican music. His towering discography comprises over 100 albums. He’s influential in the way that he’s shaped the growth and development of ranchera music. Through the hundreds of songs that feature his voice, Fernández is certain to be the associated of Mexican pride and artistry around the world. He entered a singing contest in Guadalajara when he was 14, and won first place. That win gave him the confidence to start performing in restaurants and weddings. In early 1963, his mother, Paula Gómez de Fernández, died of cancer at the age of 47. Later that year, on December 27, he married María del Refugio “Cuquita” Abarca Villaseñor, his neighbor in Guadalajara. The couple would go on to have four children: Vicente, Gerardo, Alejandro and Alejandra. Working to further his career, Fernández, then 24, was tapped as vocalist by two of Guadalajara’s best mariachis – Mariachi Amanecer de Pepe Mendoza and Mariachi de José Luís Aguilar. Through his work with these groups, he was introduced to Felipe Arriaga. During that time he performed regularly on the mariachi-themed radio program titled Amanecer Tapatío (Guadalajara Morning). Soon, Arriaga and other influential friends convinced him to move to Mexico City, Mexico’s political, business and cultural capital. By late 1965, Fernández was pitching himself to the major labels based in the city. He was always turned down, but he began hanging around CBS Studios in hopes of landing an audition. Eventually Fernández got his foot in the door at XEX, the clear-channel AM powerhouse known as the most listened-to radio station in Mexico. XEX exposed him to a nationwide audience. Not content to just make records and perform live, Fernández also branched out into movies. His first film was Uno y Medio Contra el Mundo. Three years later, he had his first hit starring role in La Ley del Monte. The movie’s title song was also a hit for Fernández. Among his successful albums of the early 1970s were El Rey, El Hijo del Pueblo, and Para Recordar. He was building a body of work that would showcase his expressive voice and define modern mariachi music. By 1975, Fernández was admired by mariachi fans, but he wasn’t yet an iconic figure. But that was soon to change. In 1976, the composer Fernando Z. Maldonado wrote a different kind of ranchera. A ranchera about a macho guy who accepts his guilt in a failed relationship. It was a new theme, and it struck a nerve: “Volver, Volver” became a ranchera anthem. An incorrigible ladies’ man, Fernández personified the protagonist of the song. It was a magical combination of music, lyrics and voice. By the end of 1976, “Volver, Volver” had broken sales records and was being played from cars, houses and jukeboxes all over the Spanish-speaking world. Finally, Fernández was unquestionably an international star. Between recording and touring Fernández carved out a place for his family. In 1980 he built a 1,250-acre ranch near Guadalajara, called Los Tres Potrillos (The Three Fillys) in honor of his three sons. Surrounded by an irrigation canal, the ranch has the feeling of a cocoon. Entering his fourth decade of recording, in the 1990s, Fernández continued to add to his canon of classics with hits like “Aunque me Duela el Alma” (1995), “Me Voy a Quitar de En Medio” (1998), and “La Mentira” (1998), the theme song of the popular ranch-centered telenovela. He garnered a star on the Hollywood Walk of Fame and was inducted into Billboard’s Hall of Fame. On September 17, 2002, he was named Person of the Year by the Latin Academy of Recording Arts and Sciences, the producers of the Latin Grammys. The honor paid tribute to his artistic achievements and his support of the National Hispanic Scholarship Fund. Never forgetting his humble roots, Fernández also remembers his fans who live in small towns and isolated areas of Mexico, performing free shows at country fairs. As a singer, Vicente Fernández is at the top of his game. The proof is in his recent achievements, which more typically resemble those of a young, rising star than someone who’s been recording and touring for over 40 years. 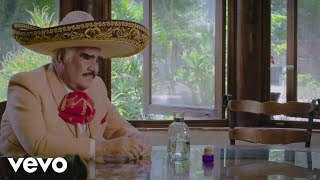 In 2006, after three years away from the recording studio, Vicente Fernández released his comeback album La Tragedia Del Vaquero (The Tragedy of the Cowboy), featuring 14 brand-new songs. A keepsake and instant classic in the mariachi music canon. Also in 2006, in preparation for Vicente Fernández’s 40th anniversary as a recording artist – Sony Music released a three-CD collection of his greatest hits, titled The Living Legend (‘La Leyenda Viviente’). Containing 35 classics, along with the new song “Me Quedan Todas,” this collectors’ ítem was avidly sought out by fans in the U.S. and Mexico. Regional Mexican and Latin pop radio, meanwhile, sent “Me Quedan Todas” to the top of the airplay charts. For 2007, his official 40th-anniversary year, El Rey embarked on one of the biggest Latin-music tours in U.S. history. And he returned with another exciting new studio album – Para Siempre, which within three months of its release was certified RIAA Double Platinum (Latin) in the U.S. and Puerto Rico. The album’s first single “Éstos Celos” spent over three months at No. 1 on the principal Regional Mexican airplay charts. The song finished the year as the most-played Regional Mexican song of 2007 in the U.S., while Para Siempre received a nomination for Best Ranchera Album at the 2008 Grammys. The success of Para Siempre continued with its title track. It was the principal song for Televisa’s blockbuster telenovela “Fuego en la Sangre,” which has produced the network’s highest ratings ever. In 2008, his achievements became even more impressive with the release of his live CD/DVD Primera Fila, which was the top-selling musical DVD of the year in the U.S. in any genre. He won a Latin Grammy in fall 2008, and in 2009 continued his awards-season streak with a Premio Lo Nuestro and a Billboard Latin Music Award. Staying at the forefront of mariachi music, he released his latest studio album, Necesito de Ti (I Need You), in July 2009, as the title-track first single climbed the charts. In order to enshrine his love and admiration for horses, for country life and for music, Vicente Fernández in 2005 built the Vicente Fernández Gómez Arena for Performances and Horsemanship. This 11,000-capacity area is located on his Los Tres Potrillos (Three Fillys) ranch outside Guadalajara. Ultra-modern and completely enclosed, the facility is popular for rodeos, sporting events and concerts. In 2005 it was the site of the LXI Congress and Vicente Fernández National Charro Championship. As the 2010s dawned, Vicente Fernández remained ubiquitous, prolific and always interesting. He wrapped up the 2000s with the December 2009 re-release of Necesito de Ti in CD+DVD configuration, featuring 13 audio and video tracks. It earned Platinum certification in Mexico, and Gold in the U.S.
One of most the most important Latin albums of 2009, Necesito de Ti received multiple recognitions for its quality and popularity. Mexico’s Premios Oye awarded him three trophies in November 2009. In 2010, Necesito de Ti was awarded the American Grammy for Best Ranchera Album. Later in the year, he also won Univision’s Premio Lo Nuestro for Ranchera Artist of the Year, and two Billboard Latin Music Awards. Dipping into the plentiful well of Vicente Fernández’s greatest moments, Sony Music in 2010 released Un Mexicano en la Mexico, a DVD of his iconic September 15, 1984, concert at Mexico City’s Plaza de Toros bullring. There, he performed to a standing-room only crowd of 54,000 for over two hours as rain continually threatened to dampen the proceedings. But, legend has it, none other than the Aztec god Tlaloc kept the showers at bay, setting the stage for a historic performance. Right back on the scene with another groundbreaking studio album, Vicente Fernández in September 2010 released El Hombre Que Más Te Amó (The Man Who Loved You Most). Despite having nothing to prove, Fernández still made a major step forward, serving as producer for the first time in his career and tapping the talents of young, aspiring songwriters. Quite a risk, but the results speak for themselves – El Hombre Que Más Te Amó won the 2011 Latin Grammy for Best Ranchera Album. Vicente Fernández is still the most popular singer, not just in the ranchera genre, but in all of Regional Mexican music. With a tremendous and still-growing discography, a powerful voice and unforgettable music, Fernández pushes the boundaries of mariachi music and influences absolutely everybody. His longevity, his dedication to his craft and his faithful devotion to his fans make him beloved in Mexico and around the world. As a pioneer, Vicente Fernández is to Mexican music what Hank Williams is to country, B.B. King is to blues and Woody Guthrie is to folk. 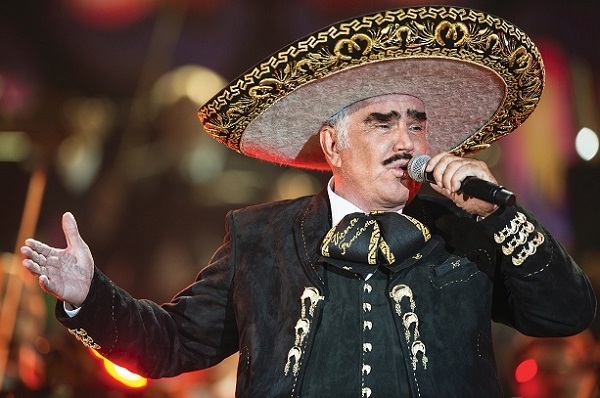 In 2011, Vicente Fernández outdoes himself again with Otra Vez (Once Again), released in November. Recording took place in the Mexican states of Jalisco and Morelos at studios belonging to Vicente Fernández himself and those of his producer Joan Sebastian. A collaboration of virtuosos, Otra Vez marks the second time that Joan Sebastian has produced El Rey – thus the title! Joan Sebastian also wrote all of the songs on Otra Vez. We enjoy a rhythmic treat on first single “Volcanes Dormidos” (Sleeping Volcanoes), which finds Vicente Fernández incorporating electric guitar into his ranchera music for the first time. It’s a beguiling fusion, and one that only maestros like Vicente Fernández and Joan Sebastian could pull off. So once again – Otra Vez – we salute Vicente Fernández, who is synonymous with studio perfection, vocal passion and an inimitable style. Like fine wine, he improves with the years. And he is a maestro for every aspiring artist.